Sometimes when it rains, it pours. But, with the new REV’IT! 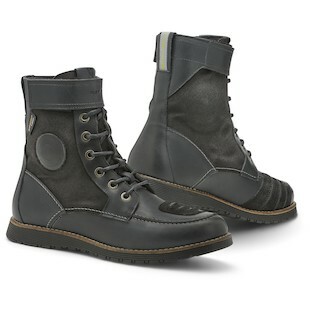 Regent and Royale H2O Boots, you can maintain kingly style for your urban jaunts- rain or shine. Stylish enough to pair with your Selvedge jeans, but still providing motorcycle-specific reinforcement in the ankle, heel, and toe, these boots are a great option to satisfy your inner chopper or cafe enthusiast. The REV'IT! Regent H2O Boots feature a beautiful Apache Batido Cowhide/Oxford Textile shell which gives the boot a great, textured look. Along with a Hydratex membrane and Coolmax mesh liner- it’s essentially a boot sandwich of epic proportion. Plus, reflective piping on the heel gives the rider additional visibility when the sun goes down. The REV'IT! Royal H2O Boots have more of a traditional Moccasin sole, and use Full Grain Leather along with Oxford Textile which gives the boot more character as it ages. Other than that, the recipe is still the same. Additionally, the ankle adjustment strap is great to keep things locked down for the twig leg crowd. In conclusion, it is nice to finally have fashion and function converge together. These new REV’IT! 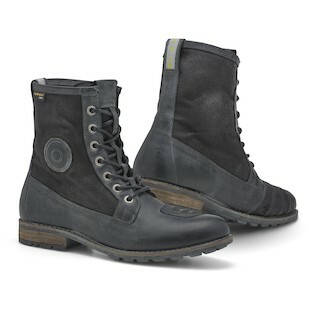 boots give the urban rider more practicality for commuting or a night out on the town.